Final Objective: On completion of this module you will be able to evaluate and manage a patient’s airway both in routine and difficult cases. Carefully evaluate a patient’s airway to identify potential problems with intubation and mask ventilation. Identify the indications for tracheal intubation. Adequately bag-mask ventilate, intubate and insert a laryngeal mask into a patient. Make decisions about the management of failed intubation for elective and emergency surgery using a difficult airway algorithm. Establish an emergency airway for the patient who cannot be intubated nor ventilated. Identify and manage the obstructed airway, inadequate ventilation, inadequate oxygenation and failed intubation. Anaesthetists are airway experts. Every anaesthetist needs to be able to manage a patient’s airway to ensure adequate oxygenation in both the elective and emergency setting. To achieve this, the anaesthetist needs to anticipate difficulties and to plan for the unexpected difficult or failed intubation. Alternative airway management techniques should be practiced regularly so they can be performed efficiently when there is an emergency. A difficult airway may present as difficult ventilation, difficult laryngoscopy, difficult intubation or a combination of these. 30 - 40% of anaesthetic related deaths are due to the inability to manage the airway, resulting in hypoxia. The definition of difficult intubation is greater than 3 attempts at intubation, or greater than 10 minutes of attempted intubation. The incidence of difficult intubation is about 0.5 - 16.6% (the rate varies depending on the definition). 15% of difficult intubations were also associated with difficult mask ventilation. There are three broad categories of difficult intubation. They are the known or expected difficult airway, the potentially difficult airway and the unexpected difficult airway. Clearly, the ability to accurately predict a difficult intubation or ventilation is important in the ability to plan for alternative airway management. Unfortunately, the sensitivity and positive predictive value of preoperative tests is not high enough to predict all difficult intubations, however, when used in combination, the sensitivity and positive predictive value increases. Every patient for anaesthesia, regardless of the planned anaesthetic technique should have an airway assessment. Evaluation of the airway includes a careful history and examination. Rarely, are any more detailed tests required. A history of difficult intubation should alert the anaesthetist to a difficult airway, as physical examination may be unremarkable in some patients who have a difficult intubation. If there is an existing breathing problem, difficulty sleeping in the supine position or abnormal voice quality, the anaesthetist should be wary of a problem. Stridor at rest in an adult indicates a serious degree of airway obstruction with a cross sectional opening of less than 4 mm. It is useful to try to identify the cricothyroid membrane before anaesthesia in the event that an emergency surgical airway is required, remembering that 16.3% of difficult intubations will not be predicted. There are some physical and medical conditions that will increase the potential for difficult airway management. These include obesity, pregnancy, rheumatoid arthritis, congenital abnormalities, airway infection (which can cause major problems in children, especially peritonsillar abscess, retropharyngeal abscess and epiglottitis), trauma of the head and neck, tissue destruction (surgical scarring, burns, radiotherapy) and tumours. Is there a potential for difficult laryngoscopy? Can the patient be ventilated without intubation? Is there a risk of aspiration? Will the patient tolerate a period of apnoea? A predicted difficult intubation calls for an “awake” intubation technique if intubation is necessary. Successful airway management ensure adequate tissue oxygenation. Most airway related deaths and morbidity result from a failure to ventilate and oxygenate rather than a failure to intubate. It is important for the anaesthetist to be skilled at airway management without tracheal intubation. Anaesthetic facemasks are designed to fit the contours of the face with minimal pressure. They are cushioned to minimize the leakage of gases and come in different sizes. The correct size for the patient will minimize dead space and provide a good seal. Paediatric masks can be cushioned circular masks or the Rendell-Baker mask, which is designed to minimize dead space. Once the patient loses consciousness in the supine position, the tongue and epiglottis fall towards the posterior pharyngeal wall tending to obstruct the upper airway. The anaesthetist can perform chin lift and jaw thrust manoeuvres to open the airway. The facemask is held onto the face using the thumb at the bridge of the nose, fifth finger behind the angle of the mandible and the rest of the fingers pull the mandible into the mask. The mask should not be pushed onto the face. Edentulous patients and beards will make it difficult to achieve an adequate seal with a facemask for positive pressure ventilation. Pharyngeal airways relieve upper airway obstruction caused by soft tissue relaxation during unconsciousness. They are able to separate the soft tissues from the posterior pharyngeal wall. Insertion will require attenuation of the upper airway reflexes to prevent regurgitation, gagging and laryngospasm. Measuring the distance from the tragus of the ear to the corner of the mouth allow the anaesthetist to chose the correct size of an oral airway. Dr Archie Brain developed the laryngeal mask airway in the 1980s. It is a supraglottic airway device that allows the patient to breathe spontaneously under anaesthesia or be ventilated with positive pressure up to 20 cm of water safely. 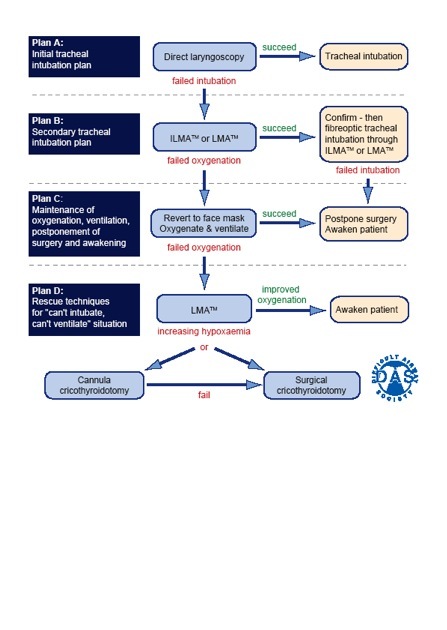 The LMA will not protect the patient from aspiration of regurgitated contents and will not be adequate for prolonged positive pressure ventilation. The LMA consists of an elliptical bowl-shaped mask that sits over the laryngeal inlet surrounded by a cuffed rim. There is a tubular portion that sits in the oropharynx and mouth. It can be connected to the breathing circuit. It is available in adult and paediatric sizes and there is now a version with a gastric lumen that sits in the upper oesophagus to reduce the risk of regurgitation into the larynx (ProSeal). A reinforced version is also available. The intubating LMA is used to enable the passage of an endotracheal tube and can be used as an alternative to direct laryngoscopy, particularly when direct laryngoscopy is difficult. Insertion of the LMA requires the upper airway reflexes to be suppressed to prevent coughing and laryngospasm. The cuff is fully deflated and the mask is lubricated on the non-laryngeal side. The patient’s head is tilted back and the mask is introduced into the mouth so that the tip of the mask follows the curve of the palate until it rests in the upper oesophagus. The index finger may be used to guide insertion. The cuff is inflated so that the tube is seen to move forward. The LMA is well suited for the spontaneously breathing patient having a short procedure. It is comparable to face mask anaesthesia. Its benefits include the ability to ventilate when facemask ventilation has failed, the ability to facilitate blind or fiberoptic tracheal intubation and that it is easily learned. Limitations of LMA include difficultly achieving proper positioning; gas leak with airway pressures over 20 cm water and limited protection against aspiration and no protection against laryngeal spasm. The ProSeal LMA has been designed with a gastric lumen and can be used with slightly higher positive airway pressures. The gastric drain tube will direct regurgitated fluid away from the larynx and can be used to establish rescue ventilation and decompress the stomach when there has been a failed intubation with gastric distension after attempts at facemask ventilation. Cricoid pressure will impede the insertion of a LMA so will need to be released to allow insertion. Tracheal intubation allows the anaesthetist to control the airway and ventilation. It is indicated when there is a risk of aspiration and when there is a need to administer a muscle relaxant for surgical reasons, such as surgery in the abdomen or thorax. The need for controlled ventilation over a prolonged period is best achieved with endotracheal intubation (the need for prolonged ventilation in an intensive care setting may eventually be better achieved with tracheostomy). Intubation allows the patient to be positioned prone, sitting, lateral or head down, thereby minimizing concerns about loss of control of the airway. Surgery that positions the anaesthetist away from the airway is better managed with an endotracheal tube. If adequate ventilation cannot be achieved using a facemask or laryngeal mask airway, intubation can allow for good control of the airway and ventilation. Intubation during cardiopulmonary resuscitation allows for ventilation with 100% oxygen with no leaks, enables airway suction and is a route for the administration of some emergency medications. Skilled assistance is essential when intubation is planned. The assistant may be required to hand over equipment, apply cricoid pressure or provide external manipulation of the larynx to improve the view at laryngoscopy. The assistant may be called upon to call for help in the event of an airway emergency. Backup equipment for the unanticipated difficult intubation is highly recommended. Patient preparation includes information, intravenous access and positioning so as to optimise the view at laryngoscopy. Positioning with the head extended at the atlanto-occipital joint and slightly flexed at the lower cervical spine can be achieved with the use of a pillow under the head (sniffing position). More obese patients may require more than one pillow under the shoulders and head. Monitoring of the patient includes blood pressure, oxygen saturation, electrocardiography and end-tidal carbon dioxide and oxygen monitoring. Rigid laryngoscopy is the simplest, most successful and frequently used method of visualizing the larynx for intubation. Once the patient is positioned in the “sniffing position”, the left hand grasps the open laryngoscope with the fifth finger just above the blade. The blade is introduced into the right side of the mouth to sweep the tongue towards the left. When the blade of the laryngoscope passes the fauces, it is directed medially towards the epiglottis. The tip is the directed into the glossoepiglottic reflection for a curved blade or posterior to the epiglottis if a straight blade is in use. Pulling up and away from the anaesthetist (in the direction of the handle) elevates the tongue and epiglottis to expose the vocal cords. Levering on the teeth with the laryngoscope is to be avoided. The view at laryngoscopy is graded according to the Cormak and Lehane classification. It describes how much of the larynx was visualized during laryngoscopy. External manipulation of the larynx in an upward and rightward direction can bring the larynx into better view. The common problems with direct laryngoscopy include inadequate positioning, inadequate mouth opening, selection of the wrong blade, allowing the tongue to hang over the right side of the blade and obscuring the line of vision with the endotracheal tube during insertion. Rapid sequence intubation is performed in the patient with a risk of regurgitation and pulmonary aspiration. The aim is to secure the airway with a cuffed endotracheal tube rapidly after the loss of consciousness. It is done in a careful and controlled manner. Preoxygenation is performed in order to fill the patient’s functional residual capacity with oxygen so as to allow for a longer period of apnoea. Upon loss of consciousness, cricoid pressure is applied to inhibit passive regurgitation of gastric contents into the oropharynx. A rapid acting muscle relaxant (suxamethonium) is used to provide good intubating conditions. Cricoid pressure is maintained until the endotracheal tube is inserted and its cuff is inflated and correct positioning is confirmed. “Awake” intubation is performed in the patient who is at high risk for difficult intubation and is at risk of aspiration. Sedation is given, but verbal contact with the patient is maintained. It is important to avoid over sedation and apnoea. A drying agent such as glycopyrrolate is given to reduce secretions and to improve the effectiveness of topical anaesthetics. Topical anaesthesia is applied to the airway. This is usually achieved using lignocaine. It is possible to perform rigid laryngoscopy in the alert patient with adequate local and topical anaesthesia. A size 6 endotracheal tube can be inserted through a size 3, 4 or 5 LMA. This is useful for intubating the patient who cannot be intubated in the conventional way. It is also possible to pass a guide such as the gum elastic bougie through the LMA into the trachea over which an endotracheal tube may then be inserted. The intubating LMA is especially designed to allow for intubation in the patient who is difficult to intubate. It can also be useful in the “can’t intubate, can’t ventilate” situation, when the LMA portion is used to ventilate the patient before making further attempts to intubate. The blind nasal intubation technique can be performed in the conscious or unconscious patient. In order to improve safety, it is usually performed in the conscious patient. It is useful if the patient cannot open the mouth. The nasal mucosa is anaesthetised with topical anaesthetic and a vasoconstrictor is applied to reduce the possibility of epistaxis. The patient should be breathing spontaneously. The head is maintained in the “sniffing” position and a lubricated endotracheal tube is passed via the nostril into the oropharynx. If there is resistance to passage of the tube at this point, it is withdrawn 2 cm and rotated through 90 degrees before attempting to advance it. The patient is asked to protrude the tongue. As the tube is advanced toward the larynx, the breath sounds become louder. The patient is asked to breathe deeply and rapidly so the tube can pass through the larynx during inspiration. Contraindications to blind nasal intubation include, nasal pathology, coagulation disorders, severe mid face trauma and previous trans-sphenoidal surgery. Laryngeal masses, scarring and oedema can make it difficult to perform blind nasal intubation. Retrograde intubation involves the passage of a wire from the cricothyroid membrane, through the larynx and out through the nose or mouth. An endotracheal is passed over a guide over the wire into the trachea. Direct laryngoscopy can cause trauma to soft tissues, teeth, the tongue, pharynx, larynx, trachea, nose and nasopharynx. Prolonged intubation may cause tracheal stenosis. Manoeuvres to clear the airway and position the patient may traumatize the neck, temporomandibular joint or spinal cord if there is trauma or degenerative disease. Direct laryngoscopy induces a reflex sympathetic response, which causes hypertension and tachycardia. This can have detrimental effects in the patient who has cardiovascular or cerebrovascular disease. Laryngeal spasm and bronchospasm can occur during airway manipulation. It is important that an adequate depth of anaesthesia is achieved prior to instrumentation of the airway. If the patient is stimulated during the stage of excitement, laryngospasm is more likely. Airway secretions can also induce laryngospasm. The patient with an upper respiratory tract infection, asthma or who is a smoker is more likely to suffer laryngeal spasm. The treatment of laryngeal spasm is initially the administration of 100% oxygen via positive pressure with the facemask firmly sealed to the patient’s face. It may be necessary to administer a small dose of suxamethonium (0.25 mg/kg) to break the laryngeal spasm. If the patient makes respiratory effort against a closed glottis (or obstructed airway), negative pressure pulmonary oedema can occur. The “can’t intubate, can’t ventilate” (CICV) scenario is a rare event. It can occur in anaesthetics or in the emergency and intensive care settings. Techniques for the management of this situation are either cannula cricothyroidotomy or surgical cricothyroidotomy with a scalpel. 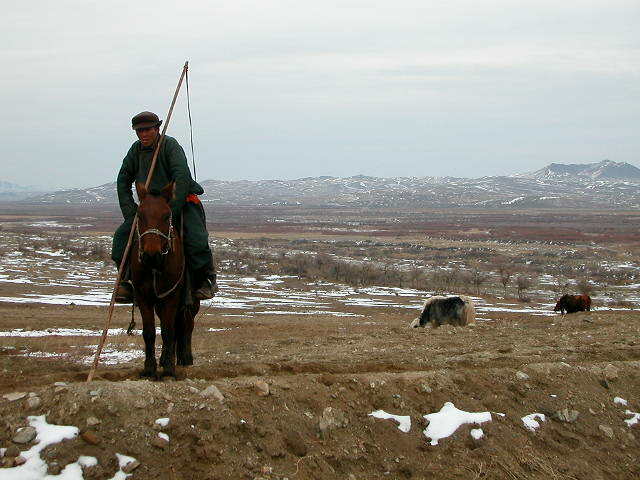 Both techniques aim to resolve the CICV situation by providing adequate oxygenation. The cannula technique is considered a tempory measure until a definitive cuffed airway can be established or until the patient resumes spontaneous ventilation. Cannula cricothyroidotomy provides a brief period of adequate oxygenation. It does not provide adequate ventilation. Cannula cricothyroidotomy can fail if there is obstruction of the upper airway, as this will not allow air to escape and may cause barotrauma. Every attempt must be made to have a patent upper airway (eg jaw thrust, chin lift, oropharyngeal airways). Blood and vomit may cause obstruction. Incorrect placement of the cannula can cause subcutaneous emphysema and further distortion of the neck anatomy. A large bore intravenous cannula, preferably 14 or 16G size with a sharp needle and plastic cannula that will reform its lumen easily if it kinked or squeezed. A 14G cannula will allow greater flow and will be more resilient. A 5 ml syringe is attached to the cannula by removing the cap of the cannula. It needs to be filled with one ml of saline to help provide a positive endpoint of bubbles when the cannula is placed in the trachea and air is aspirated. Technique A right-handed operator should stand on the patient’s left side to enable the needle to be introduced through the cricothyroid membrane in a caudad direction. Stabilize the airway with the non-dominant hand and insert the needle with the dominant hand holding the syringe between the flange and plunger to enable aspiration as it is introduced. Typical insertion should occur at right angles to the neck. The endpoint is the aspiration of air up the whole length of the syringe. The cannula is advanced over the needle into the airway and the trocar (needle) is removed. It is essential to hold on to the cannula to prevent its removal. Aspiration is checked again with the syringe containing saline. “Jet ventilation” can then begin. Jet ventilation is achieved by providing high flow oxygen intermittently via the cannula. There are many ways to achieve this. One way is to attach a 3-way tap to the end of the cannula. The opposite end of the 3-way tap is attached to oxygen tubing attached to a high flow oxygen source (maximum flow on a wall oxygen flowmeter or with the oxygen flush button depressed on the anaesthetic machine). The third opening of the tap is occluded intermittently with a finger to introduce oxygen through the cannula into the trachea. When the opening is not closed, oxygen will flow into the atmosphere. The neck should be observed carefully for swelling which indicates incorrect paratracheal placement of the cannula. The rate-limiting step for the frequency of jet ventilation is the patency of the upper airway. If the upper airway is obstructed, there will be a failure of the chest falling, indicating that there is breath stacking, which may cause barotrauma. The obstructed upper airway may be relieved using jaw thrust, chin lift or a laryngeal mask insertion. This technique oxygenates the patient but is not an efficient at eliminating carbon dioxide so it is used as a temporary measure until a definitive airway can be established. This involves making an incision through the cricothyroid membrane to allow the introduction of a tracheal tube. It will allow the patient to be adequately ventilated as well as oxygenated. The cuff of the tube will also afford some protection against aspiration. A size 10 scalpel, which is usually readily available in the operating room is used to make an incision. A bougie is used as the guide for the introduction of the size 6 endotracheal tube. The cricothyroid membrane is identified and stabilized with the non-dominant hand. A horizontal stab incision is made through the cricothyroid membrane and the blade is rotated through 90 degrees so that the blade points caudally. The scalpel is pulled toward the operator and held perpendicularly so that a triangular hole is produced. The non-dominant hand then holds the scalpel whilst the bougie is inserted using the blade of the scalpel as a guide. The bougie is then directed along the line of the trachea and inserted to the carina. A size 6 endotracheal tube is lubricated and passed over the bougie. It is continually rotated to facilitate insertion through the skin and trachea. The circuit is attached to the tube and bilateral ventilation is confirmed. Any crisis requires a systematic approach. Prepare equipment- assorted laryngoscope blades, endotracheal tubes, nasal and oral airways, LMA, suction catheters, intubating stylets, Magill forceps, fiberoptic kit, 14g needle syringe, retrograde wire kit, jet ventilator, tracheostomy tray and topical anaesthetic. 1. If the foreign body is in trachea or larynx, perform inhalation induction with maintenance of spontaneous ventilation; avoid assisting with positive pressure as it may move the foreign body more distally. Perform laryngoscopy and remove the foreign body if it is in the larynx or pharynx. 2. If FB is in trachea, intubate with the ventilating rigid bronchoscope and remove FB or intubate with small ETT and pass bronchoscope beside it. 3. Manage potential postoperative complications including upper airway obstruction, lower airway obstruction, haemoptysis, pneumonia, and pneumomediastinum. 2. Inhalational injury –emergency tracheostomy if obstructed or observation, oral or fiberoptic examination looking for soot, burns, erythema, intubate early if suspect airway burns. Outline the routine airway assessment. List the indications for tracheal intubation. List the complications of tracheal intubation. What is the optimal position for tracheal intubation and why? Outline the indications and sequence of events in a rapid sequence induction. Summarise the alternatives to intubation in a patient having elective surgery. When should one consider a cricothyrotomy? You have been asked to set up a “difficult airway trolley” for your suum hospital. Based on what you know is available, outline what pieces of equipment you will need and when they should be used. You may wish to develop your own difficult intubation algorithm based on the equipment you have chosen. Will you be able to manage an unconscious, head injured patient with facial injuries using this equipment? Burmaa is a 40-year-old mother of three who has come in for a removal of a breast lump. She is anxious about the fact that she had a very sore throat after her last anaesthetic. What are the options for airway management for a short procedure such as breast lump removal? What further information would you seek from her about her previous anaesthetic? Are there any other features on history or examination that would indicate that she requires tracheal intubation? Her mouth opening is restricted. What degree of mouth opening would you be concerned about? Outline how you would assess her airway at the bedside before tracheal intubation. You are called to the recovery room to assess a young woman who has just had a D&C for a blighted ovum. The nurse is concerned because her saturation has started to fall. Outline your assessment of the situation. What are the causes of hypoxia in recovery? What are some simple airway manoeuvres you could use to try and relieve airway obstruction in recovery? Outline your management of inadequate ventilation after a general anaesthetic. You have induced a general anaesthetic for an emergency laparotomy. After giving the suxamethonium, you perform a laryngoscopy only to find that you cannot see the larynx and only the tip of the epiglottis is visible. What can you do to improve the view at laryngoscopy? Are there any special devices or techniques that you can use to achieve successful tracheal intubation? You find that you cannot intubate this patient and that the saturations have started to fall. What can you do to improve the patient’s oxygenation? The saturations fall to 70% during the next minute. What is your immediate response? What will you do if you cannot intubate or ventilate this patient?